Is your website making good Return on Investment? Good design can make or break your hospitality business, especially if you rely on online portal as the major source of your booking. In this article we will cover the most important elements that make great hospitality websites. People nowadays are experience-hungry, they could go for a mile just to taste the latest burger junction in town or enjoy the view of mountain tops and experience cabin lodging, and a lot of other activities. And travelling has become easier than ever. Transportation even cross continents has become affordable, e-booking and e-reservation is now the norm, English is widely spoken in many countries. And then there are more places to go, more things to see, and more facilities that accommodate the essential needs of the travelers. The Hospitality Industry or the Service Industry in general, is currently benefitting from the new kind of market people in this generation are going after. With the fast growing market, comes the fierce competition, however. Standing out and making a good impression that can convert and retain loyal customers has become the survival mission for businesses in this industry. Did you know that 80% of people booking holidays online? Are you putting in enough effort to win your competitors in this fierce market, or are you losing out this battle? Lets find out! 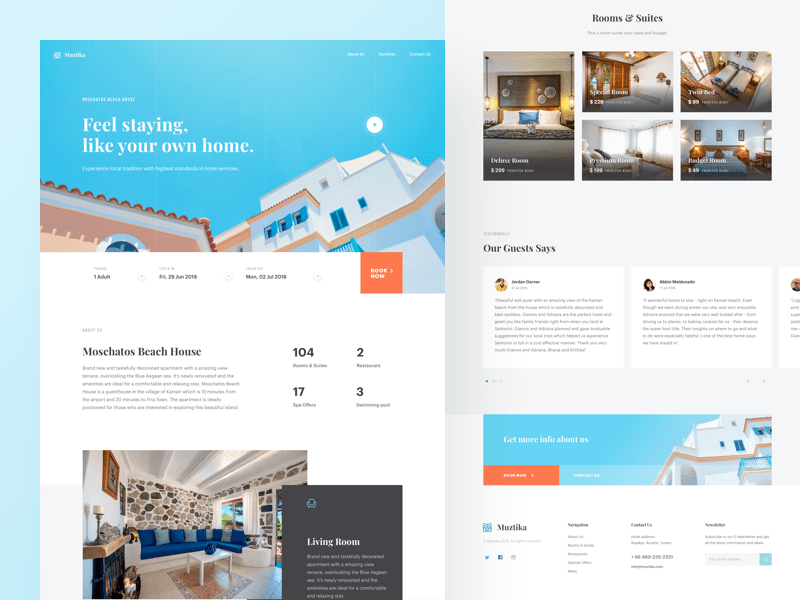 In this article, we will be giving tips on how you should build your hotel’s website. Being equipped with the necessary information and tools to aid your business is a really good investment. 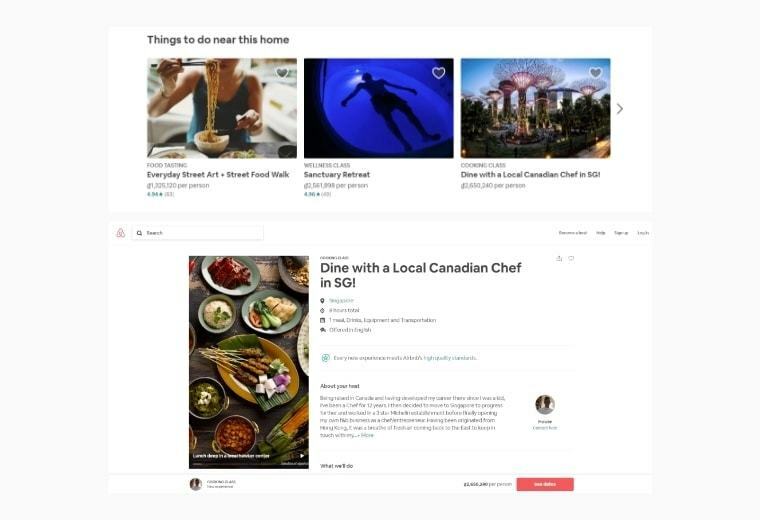 You can start by reading our tips on How to design a perfect travel website as a reference of what you should include in your own to maximize user experience. Currently, for simplicity sake, we can break down hotel categories into two types, the Hotel Chains and Boutique Hotels. Some of you reading this might be in any of these two categories, but worry not, we guarantee you getting the best information you need for your website in this article. But before going into details, allow us to differentiate these two for those who have no idea on their differences. One can easily differentiate the two from the services offered, location, facilities and amenities. If you are a go-traveler who wishes to experience a stay that could somewhat reflect how the natives around the area live, then a Boutique Hotel is probably what is best for you. A boutique hotel offers travelers a personalized experience. Mainly because they are a native to the place, they can showcase food, artworks and activities that are unique to their location. You can get the service you deserve from their relatively cheaper price, in comparison to Hotel Chains, but definitely not as high-class as Hotel Chains could offer. But if you are the kind of traveler who wishes to experience a somewhat standardized stay, common to many hotels, then booking at a Hotel Chain might be better. Their prices are relatively higher due to the vast amenities and facilities they offer which others would term as high-class. This does not mean that one is better than the other in some ways, and vice versa. People also have their own preferences. So if you are a business owner on any of these two, we could only advise one thing and that is to let your website tell your hotel’s story and let the people experience it beforehand. Reflect your services on your website, so they could feel this urgency to book from you out from the connection made. Regardless of the type of hotel you own, we present here some general must-haves for every hotel website. The goal is to offer relevant information as much as you can to sell your business, while ensuring maximized user experience. Don’t tell too much, just offer enough to make them want to experience what you offer in store for them. You want to invite these strangers to come to your place, stay in your rooms, and entrust their assets and safety to you. You better tell them a really good story and show them all the facts and proofs of your service excellency. In this section, tell them all about your business. This includes your humble beginnings, where you are located, some contact information, received recognition and awards and all other necessary information that you think would turn potential clients into supportive patrons. Include facts and figures and make sure that all of them will point to your business once a client decides to dig deeper in your posted information. You know, some clients are like CIA that they would know whether you are a hoax or the real thing. So make sure not to exaggerate and only tell the truth. This is probably the most sought after in any business, not just in the hotel industry. What makes a website relevant in any type of business is its ability to reach a much wider range of audience in real time. 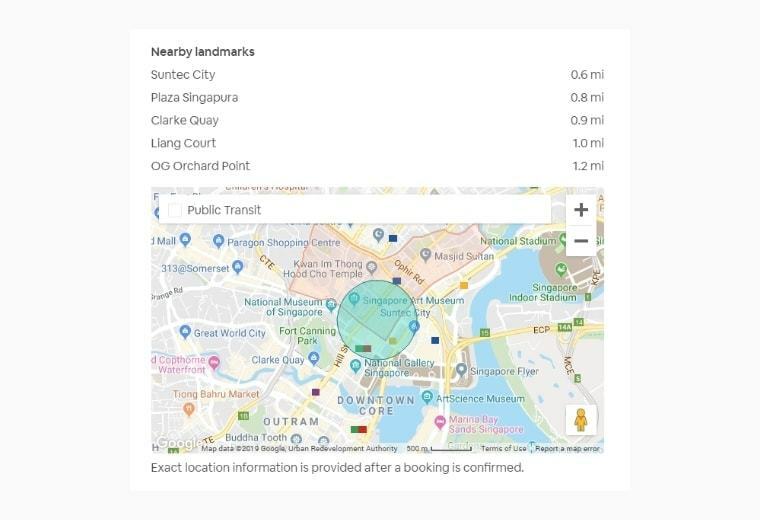 Even if your hotel is located in the outskirts of UK, there is still a probability that you can receive bookings from Vietnam or Philippines. This is because potential clients can view your exclusive deals and promotions anywhere around the globe by going online. As a business owner, your ultimate goal in investing on your website is to receive significant ROI. So make use of your website in promoting whatever deals you have and how different they are from your competitors. Just make sure you get this portion of your website updated as often as you can, so that potential clients and existing patrons will get to see what you have during that specific time. Remember to remove expired deals as well, showing deals that are no longer valid on your website can confuse and discourage your users. Since you are a hotel, this section is what you are actually selling. All else are considered additions to your business. So this section should never be absent from your website. Upload high quality photos of the rooms you offer and make sure they reflect the quality of your rooms. We have seen huge 4 stars, 5 stars hotels that were not willing to spend enough for professional photographers to take good pictures of their rooms and that resulted in missed opportunities to impress potential guests. We have also seen hotels that over-used photo editing and that resulted in disappointing guests that later spread bad reviews and ratings. When taking photos, if you have a wide variety of room types, differentiate one from the other. This includes the room size, facilities within the room, views they can possibly enjoy and other information relevant to this. The key thing to remember is to not leaving any room for surprise, especially the kind of surprise that can let your guests down. For most Hotel Chains, there are already standardized room categories. But for Boutique Hotels, we highly suggest that if your rooms showcase different characters, then highlight them as much as you can in your definition. Unlike Hotel Chains, this is your selling factor, a personalized experience. So don’t forget to highlight things that need to be placed on the spotlight. Like we said, these are just additions in your business. Yet, these are major considerations that most clients look in to as well. Just like your room types, make sure to list all facilities and services your hotel offers, for this is one of the factors clients look into before hitting the “Book now” button. Clients have different preferences and personalities. Some prefer booking a hotel that is several miles away from their activity’s location, simply because their room has a Jacuzzi or the hotel lounge offers Jazz Nights every night. Others might prefer proximity rather than facilities and amenities. But nonetheless, your goal is to make your clients’ stay as pleasing and as remarkable as you can. So tell them all about what your hotel have to make their stay worthwhile. As a hotel, never leave this portion unavailable. Tell them your location not just because you want your clients to know where you are rooted, but telling them is also one way of helping them decide whether your hotel is their best option. Like we said, some prefer proximity than anything else. So if your hotel is located at a central location for various kinds of activities, then you must be one lucky hotel. In this case, your location is actually one of your best assets. For Boutique Hotels who are located at a somewhat remote area, worry not for you can still sell your business. Tell them instead of nearby activities and locations that they could visit if they choose you. Putting up a map of your location will help them visualize. For Hotel Chains, if you are located in the city, probably you can do the same thing and tell them about some nearby activities going on. You can also include here your shuttle service schedule if you have one. Relating to above scenario, whether you are a Hotel Chain or a Boutique Hotel, listing down activities near you is also one way of selling your business. This could go from small ones, such as a food market, to big ones, such as festivals. You can include malls, restaurants, bars, parks and others as well. So, after selling your business, it’s now time to dig into your booking procedure. Aside from the visuals and the UI of your website, your booking process is actually where you should try to maximize user experience while minimizing your business’ booking system costs. This gives you the ultimate customization of how you want your booking process to be. And since this type of booking goes directly into your account, including user information, this type of system comes at a much higher cost. The cost to build this booking system is estimated to be around 10000 USD and up. Note that even if you are to build your own booking system, integrating it with other 3rd party applications or websites is necessary to sync your existing promotions and room types to multiple booking channels. This includes Traveloka, Booking.com and TripAdvisor to name a few. This type of booking involves embedding an external booking system to you website. When clicked, your clients will be brought to that party’s website, which is where the actual booking takes place. This option is relatively cheaper. However, the downside of it is that you won’t be able to customize your booking process and collect necessary information relevant to improve your business. This includes clients’ preference which is important to help your business become more intimate in addressing their needs. 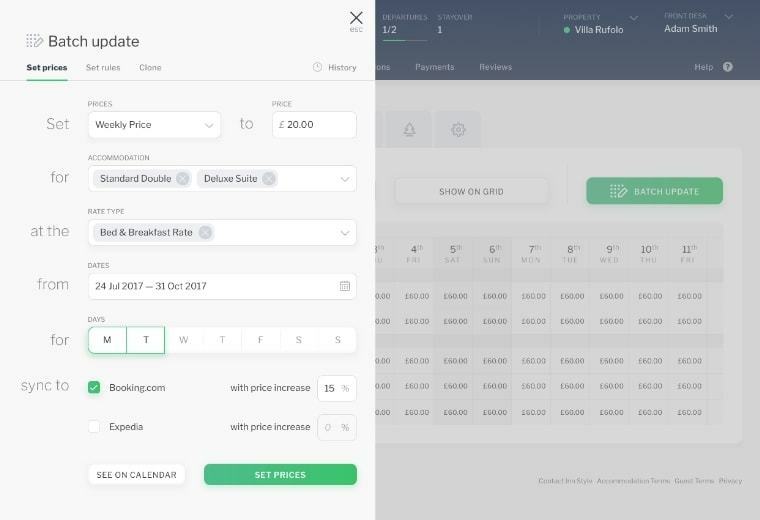 With this option, you can get a booking system with a monthly subscription. What kind of business that does not want to hear from their current and potential clients? For some businesses that do not have online booking yet, this is your online booking. You want to make sure your contact section or page contains the necessary and alternative contact methods. We suggest to have at least a contact form, a visible phone number and a visible email address. Don't overwhelm your customers with so many contact information on the page, however, as it will confuse them. Last but not least, periodically check your contact methods to make sure all of them work well. This section can also be used to address concerns from your clients where they reach you for help. If you wish to know how we improve customer satisfaction by handling support section better than ever, you might want to read our article Online ticket support system platform. As many of you might have known, there are already various digital marketing options you can dwell into to see which best fits for your business. For your reference, you might want to read our tips on Digital Marketing in Travel and Tourism Industry and Digital Marketing & Gen Z: How to Engage an Elusive Generation. This can serve as your checklist on what marketing ideas you could possibly use to improve the overall quality of your website and business as a whole. Aside from marketing tips and ideas presented on our sample articles above, another technology that we deem necessary for businesses with online presence is the use of Customer Relationship Management (CRM) technology. This technology allows you to manage your business’ interactions with your existing patrons and possible clients. Analyzing the data formed from their interactions within the whole site, and to how you can improve your relationship with them which will position your business on their good side. Excel sheet will get you by for the first few months but no more than that. You need a system to collect user information, segment data, and run personalized marketing at scale. Wouldn't it be nice to know serve your customers exactly the way they wanted in their last stay? How about knowing exactly who and when you should send your promotion to? 3. Increase the return rate via point reward, personalized marketing and etc. Since you have gathered the necessary data, if you wish to improve, add, or remove services to increase your gain and profit, you can easily decide which needs to stay and go. All in all, if you wish to have a better view of how your business is doing by reflecting your clients’ interaction in your website, you can now easily do so by incorporating CRM as a part of your business strategy. I am TELLE. Tolerant to challenges. Engineer by profession. Loves all my cats. Listens to music daily and enjoys writing. I am an engineer by profession but a writer and a music enthusiast by passion. I have written about various niches but is currently more inclined with marketing and pop culture.